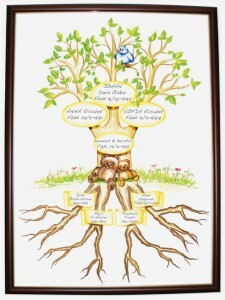 This children’s family tree is a much appreciated gift for Christenings, name-giving ceremonies, first birthdays etc. This water colour re-prodoction is printed on high quality paper and contains three generations, with teddy bears and room for one, two or three children. A tree that you fill out yourself costs SEK 250:- (shipping not included). Inspire your children or grandchildren to find their roots as they get older, with this personal gift! Order here by sending me an e-mail or go straight to the ordering page!